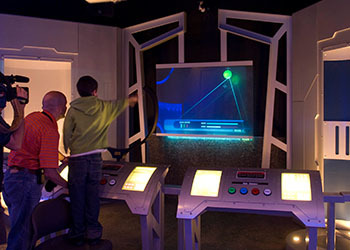 From addictive ‘Wii-like’ immersive virtual gaming and adventure simulations, to fun motion-activated special effects, games and activities on interactive floors, walls and other projection surfaces, GestureTek's interactive displays, exhibits and virtual games for single users or large groups are the best available for infotainment and entertainment purposes. Thousands of our game systems can be found worldwide. For a portable, turnkey, plug and play interactive display solution for location-based entertainment facilities check out our Cube floor projection system. GestureTek technology wows visitors at Shanghai Expo Shipbuilder's Pavilion. WallFX delights kids at Childs’ Play activity center. GestureTek created a custom HoloTrack Frame game for their Vulcan Space Adventure attraction. GestureTek introduced world’s largest mult-touch surface computing table at the Eureka Tower in Melbourne, Australia. It’s an exciting tourist information and wayfinding system. WallFX™ and Interactive video wall offers energy info at the Epcot Center. Ripley's museum utilizes GroundFX® and ScreenXtreme system for landmark Times Square location. NASA’s space exploration experience utilized one of GestureTek’s cutting edge GroundFX® systems. GestureTek’s GroundFX® interactive floors offers guests a unique and intertaining interactive experience, allowing for a virtual interaction with animals. The Hockey Hall of Fame wowed visitors with the interactive GestTrack™ display.